Israel’s Civil Administration recently approved the advancement of plans for 463 new housing units in illegal settlements in the occupied West Bank, on Wednesday, Israeli NGO Peace Now reported, according to Ma’an. Peace Now said that the Civil Administration’s High Planning Committee validated plans for 20 housing units in the settlement of Givat Zeev, 30 in Bet Arye, while 179 housing units were retroactively approved in Ofarim. The group added that plans for 234 units in the settlement of Elqana were being discussed for depositing. According to Peace Now, Israel has promoted plans for 2,623 new units in West Bank settlements since the beginning of the year, 756 of which were retroactively legalized construction. “The (Benjamin) Netanyahu government continues to plan and build all over the West Bank, while also giving settlers the message that any construction done without planning will be retroactively legalized,” the NGO said in a statement. “Not only that the Netanyahu government does not believe in a two states solution, it is actively trying to kill it by building more and more in the settlements. This policy contradicts the very essential interests of the state of Israel,” the group added. Peace Now’s announcement came as Palestinian Prime Minister Rami Hamdallah demanded during a meeting with the United States Consul General to Jerusalem Donald Blome, on Wednesday, that the US take more serious action to stop Israeli settlement activity. 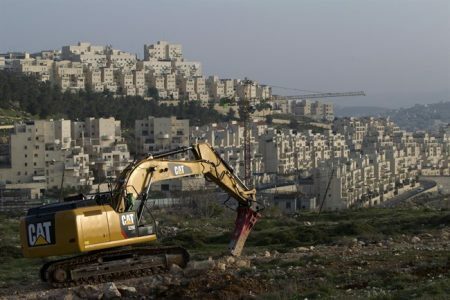 A statement released by the spokesperson for Israeli Prime Minister Benjamin Netanyahu called Mladenov’s statement “as the claim that American construction in Washington or French construction in Paris is illegal,” despite the fact that each of the 196 Israeli government-approved settlements scattered across the Palestinian territory were constructed in contravention of the Fourth Geneva Convention — which forbids the transfer of civilians from an occupying power into areas it occupies. The statement did not address the mass displacement of Palestinians prior to and following the establishment of the state of Israel which some historians and rights groups have called “ethnic cleansing,” in addition to ongoing Israeli policies of home demolitions and state violence. Israel has come under harsh criticism for a spike in illegal settlement activity in recent months, with plans for thousands of housing units moving forward in various stages in occupied East Jerusalem and the West Bank. Human rights groups and international leaders have strongly condemned Israel’s settlement construction, claiming it is a strategic maneuver to prevent the establishment of a contiguous, independent Palestinian state by changing the facts on the ground, while members of Israel’s parliament, the Knesset, have publicly announced their support for plans aimed to annex the entirety of Area C.
While members of the international community rested the solution to the Israeli-Palestinian conflict on the discontinuation of illegal Israeli settlements and the establishment of a two-state solution, Israeli leaders have instead shifted farther to the right as many Knesset members have called for an escalation of settlement building in the occupied West Bank, and with some having advocated for its complete annexation.